Berkeley scientists have combined computational modeling and advanced materials synthesis to devise a low-cost anode that bolsters the feasibility of long-life lithium-ion batteries. Electric cars will remain a tough sell until they can travel beyond 100 miles before needing to recharge their batteries. The battery-life bottleneck has driven the search for technologies that extend the energy storage capacity of lithium-ion batteries. A collaboration, led by Gao Liu of Lawrence Berkeley National Laboratory’s Environmental Energy Technologies Division and Wanli Yang of Berkeley’s Advanced Light Source, has developed a next-generation battery that could fill the need. 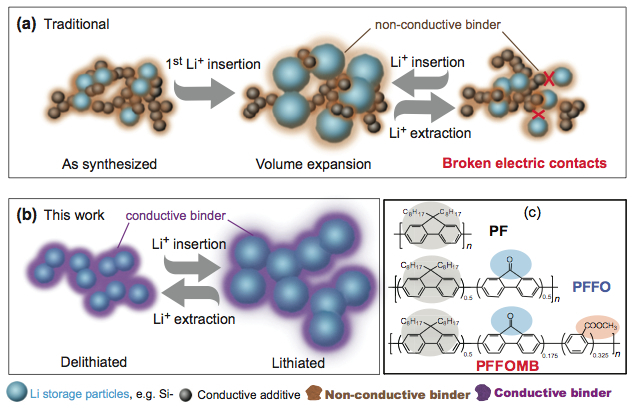 Combining computational modeling and advanced materials synthesis, the Berkeley Lab scientists sought a low-cost anode to provide the needed battery boost. Their solution involves replacing inert graphite with silicon nanoparticles bound to a polymer that absorbs eight times the lithium and becomes electrically conductive as it does. The researchers hope the advance will help power the next generation of electronics and extend the range of electric vehicles. They key to the advance was making silicon a practical anode material. Scientists have known for decades that a silicon atom can absorb almost four lithium atoms. But in doing so, it balloons to three times its size. The shrinking and swelling during each round of discharging and charging have made silicon an impractical choice for battery anodes. Materials scientists have tried a work-around by forming the silicon into nanoparticles and connecting them with an inert polymer binder and a graphite electrical conductor to improve performance. After a few charging and discharging cycles, however, the graphite tends to lose contact with the silicon nanoparticles, reducing its conductivity. The new-generation polymer acts as both a mechanical binder and an electrical conductor. After testing several variations, the Berkeley Lab group designed a variant of a polyfluorine-based polymer hat worked much better than a previously tested conducting polymer. They hypothesized that a particular modification to the variant polymer – the addition of a carbonyl group (a double-bonded carbon-oxygen group) – contributed to its unique electronic properties. Indeed, the researchers used Berkley’s Advanced Light Source to produce an X-ray absorption spectrum that showed there is an additional peak below the electron conduction band. But that didn’t explain how the carbonyl group and an associated additional X-ray absorption peak were related to the enhanced battery performance.